A man once thought to be near death after he suffered through a gruesome hatchet attack recently experienced an important milestone after graduating from a guide dog school in Southern California. As he takes small steps forward, Chris Aquiano, 34, is guided by a dog named “Paulie,” who comes from the Guide Dog School of the Desert, located near Palm Springs. Seeing Aquiano walking is an amazing sight considering the struggle he has endured in the last few years. Aquiano was attacked in the early morning hours of July 9, 2009 as he and his then girlfriend were sleeping in a bedroom in a home in Escondido. NBC San Diego covered the story at the time. The suspect in the attack, identified as a then Border Patrol agent named Gamalier Reyes Rivera, was after his estranged wife and her boyfriend in another bedroom of the home, but in a case of mistaken identity, he attacked Aquiano instead. During the attack, Aquiano managed to save his then girlfriend’s life, as well as others in the home. However, Aquiano himself suffered major injuries and ended up in a coma, one which doctors believed he would not survive. If he did, doctors said, his family would never recognize him. In the end Aquiano did survive, but traumatic brain injuries left him unable to walk, talk, and see. A few months after the attack, the then wheelchair-bound Aquiano regained his ability to speak enough to share his story and detail what his life was like after facing death in an interview with NBC San Diego. Just as several scars from the attacked remained, so did the emotional and physical pain, which was evident through his words. 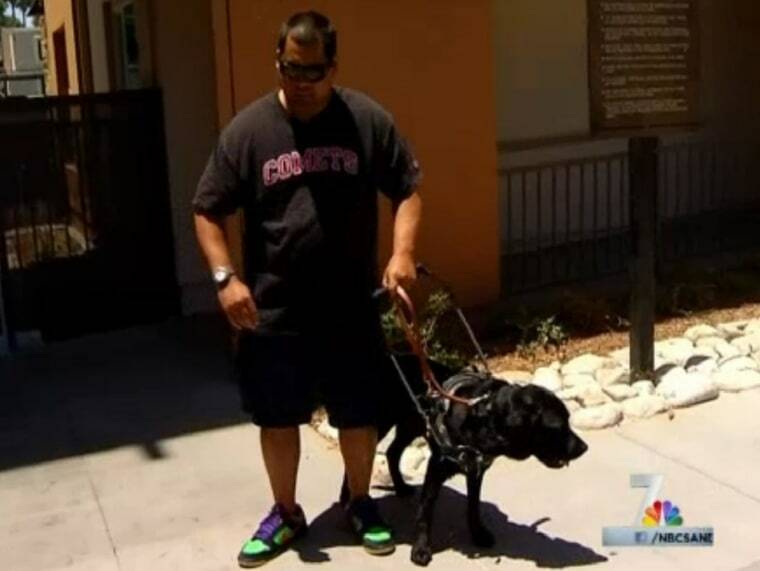 Now, years later, Aquiano spoke with NBC San Diego again after graduating from the non-profit Guide Dog School of the Desert. Holding his graduation certificate he says the program has meant a whole new beginning for him. Since enrolling Aquiano has worked with Paulie, who helps him get around and live by himself, thus giving him bring back his independence. “Paulie means everything …he’s going to help me go up the stairs safely, help guide me down streets, help me get from here where I live to Palomar College down the street,” Aquiano said. Aquiano’s new found motivation in life is also present in his career. Before the attack, Aquiano was studying at Palomar College in San Marcos to be a nurse. He’s since changed that in order to study to become a motivational speaker. “I get to share my story, which gives people inspiration and it shows that I went through a horrific attack, and I can come back from all that," he said. "It gives hope and it gives them a chance to believe again." Aquiano said his journey has been helped along by friends. He thanked a man named Paul Mazacapa, who he said sponsored Paulie and paid for the dog and the training. Aquiano also thanked Guide Dog School of the Desert, which he mentioned can always use donations. During his interview, Aquiano turned his attention to something he said back in 2009. Today, with Paulie by his side, Aquiano said his prayer has been answered.